If you're buying gold then you should read "How the gold markets work". It's on-line, and it's free, so you can read it now. It will save you money by helping you avoid a purchase of gold costing as much as 10% more than it should. It might also prevent you buying into the wrong type of gold certificate program which could cost you all your gold. You needn't make that mistake. Instead we'll explain how to buy the most trusted form of gold in the world, at the best prices, and in the safest, easiest way. Gold certificates are very much like the world's first-ever paper bank notes. Starting in the 17th century, gold certificates were issued by goldsmiths in London and Amsterdam to customers depositing gold bullion into their safe-keeping. These gold certificates then acted as proof of gold ownership. In time, the certificates were passed from hand to hand just like cash payments, without the hassle of having to move the gold bullion itself. In the mid-19th century, the US Treasury began to issue gold certificates that could be exchanged for gold from its vaults. These gold certificates circulated as money until 1933, when the US government banned private gold ownership inside the United States. Today, gold certificates continue to be issued by several German and Swiss banks, as well as by gold pool programs in Australia and the US. These certificates represent ownership of a certain quantity of gold bullion or coins. The owner of the gold certificate gets to save money on gold trading, delivery, storage and insurance costs. Investors have a strong attachment to certificates. Somehow there is a feeling that an intricate and expensively produced piece of paper is necessarily an indication of underlying value. It does not always work out this way, and the walls of finance companies everywhere are decorated with large numbers of historically interesting but entirely worthless certificates of title. There is no way, other than the surrender of all the certificates in issue, to be reasonably confident that they are backed by an exactly equivalent quantity of gold. All sorts of things can cause this not to be the case:- Duplicate certificates issued in good faith, deliberate over-issue, good forgeries, bad administration, changes of address, cancellation of old classes of certificates and their replacement, failure to destroy old certificates surrendered, etc. Certificates are capable of being duplicated about as easily as paper money, which is mildly ironic given the modern day bullion buyer's motivation - which is frequently to avoid the debasement of monetary printing. There is a better way. Using modern technology it is easy to publish every day an accessible list of all gold owners with an interest in a specific vaulted store. 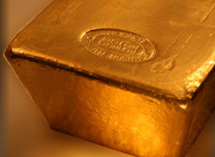 Reconciled to an underlying bar list this can provide a reliable proof that the total number of owners can claim an amount of gold exactly equal to the vaulted total. Moreover all investors' holdings can be published using a nickname which is known only to them and which, while validating their own holding to them, does not identify them. This is how BullionVault proves your gold ownership every day. BullionVault customers see the proof on BullionVault's Daily Audit - published every day and linked directly from the BullionVault home page. While for those whose attachment to certificates proves insurmountable we provide an RSS feed of their own digital record - re-issued every day to their own computer, under their own private nickname. Gold certificates are typically unallocated gold with an option to convert into allocated at the investor's option and considerable cost. We do not favor unallocated gold. We consider it an investment structure which provides free capital to the supplier, and risks total loss to the investor. So before you choose a certificate program make sure you know if the gold is unallocated - it usually is - and make a conscious decision to accept the considerable risks. Where a certificate program permits the conversion from unallocated to allocated the cost of allocating is usually prohibitive - involving a fabrication cost and an ongoing storage cost typically of 1.5% per annum. This is more than 10 times the wholesale rate for insured bullion storage, and this artificially high rate achieves its primary purpose of keeping the gold unallocated. As an investor in unallocated gold your gold is on the balance sheet as a liability and you remain exposed to the suppliers' insolvency for the long term. Given the relatively high costs involved there is little likelihood of you choosing to allocate. Depending on the level of confidence which government backing of gold investments inspires in you there may be an exception to the wider pool of unallocated certificated gold schemes. Certainly the most well-known and most respected of the certificate providers is the Perth Mint Certificate Program.